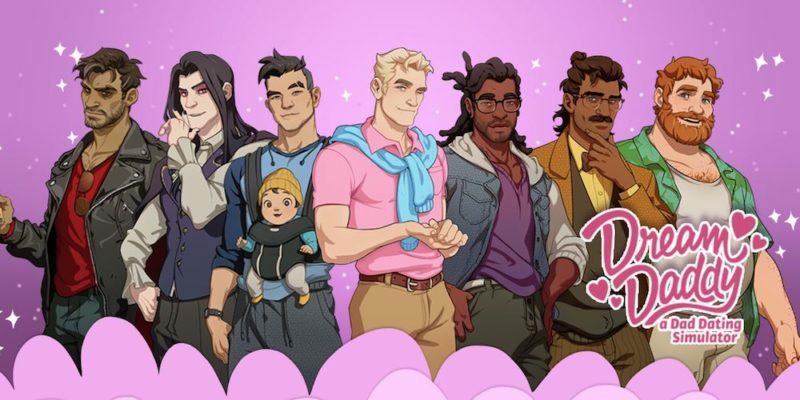 Last year, the video game Dream Daddy took the gay web by storm as players got the chance to romance a number of hot dads while seeking the perfect mate. The game’s combination of sexiness and genuine warmth won over its fans. If you were one of those fans, get ready to get even more excited, because the first issue of the new Dream Daddy comics miniseries comes out this weekend! If you initially missed out on the Dream Daddy visual novel (a sort of Choose Your Own Adventure book crossed with a video game), it follows your unnamed character, or “Dadsona” (a portmanteau of “dad” and “persona”) as he moves to the fictional town of Maple Bay. He’s a single dad, and he’s ready to meet all the other hot dads in his community — ideally, he’ll find a new lover. The game was widely praised for its outstanding art and its witty, emotionally engaging writing that made you really care whether or not your dates went well. The cast of dads was also pleasantly diverse, and you could even customize your own Dadsona however you wanted with different skin tones, body piercings and styles of facial hair to choose from. The cover of the digital edition of Dream Daddy #1. 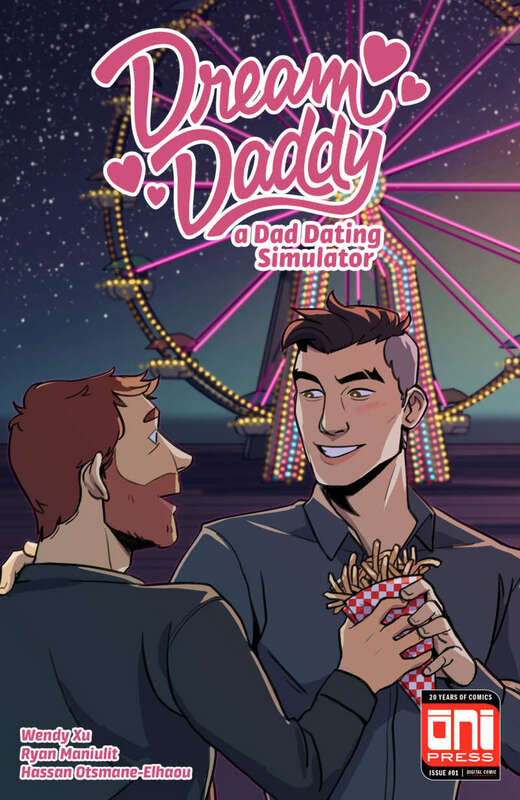 The game was a surprise hit, and though the Dream Daddy comics were teased as a “Father’s Day gift,” it took a little longer for them to hit the presses. But now, Oni Press is debuting the first issue at this weekend’s PAX West gaming convention in Seattle, Washington. Though, if you’re not in Seattle, or just are over print comics, it’s also available digitally right now. The Dream Daddy comics will publish as a five-issue miniseries, each one focusing on a different dad. Each book is written and illustrated by a different team, including comics luminaries as Iron Circus founder C. Spike Trotman, Love Machines author Josh Trujillo and original game creators Leighton Gray and Vernon Shaw. 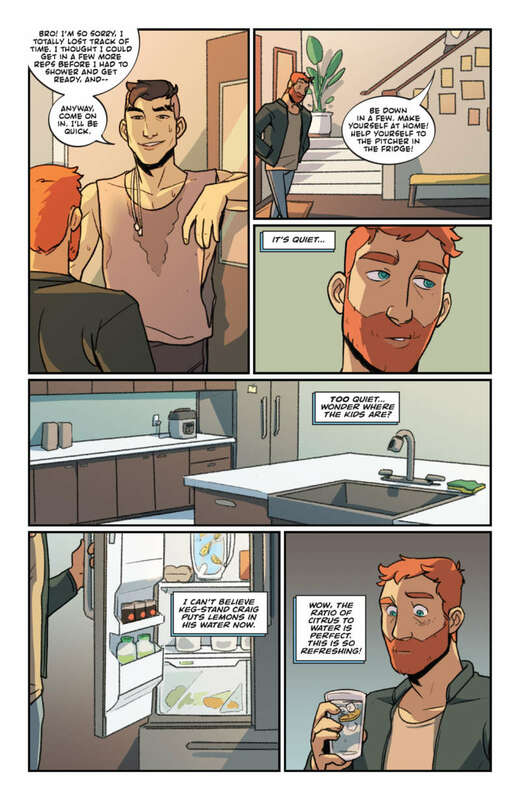 The books will be coming out monthly, and the first issue of the Dream Daddy comics focuses on Craig, “Fitness Dad.” You can even read an excerpt from this issue over at Paste, if you’re curious. But we’re pretty sure if you’re reading this, you’re at least considering the prospect of buying yourself a subscription. Are you ready for the Dream Daddy comics?